So it's Monday already (how?!) and I am definitely reminiscing about the weekend. I feel like I have been squeezing every last ounce out of Summer that I can lately, ever since we hit the 1st of September. I think I must be in denial! 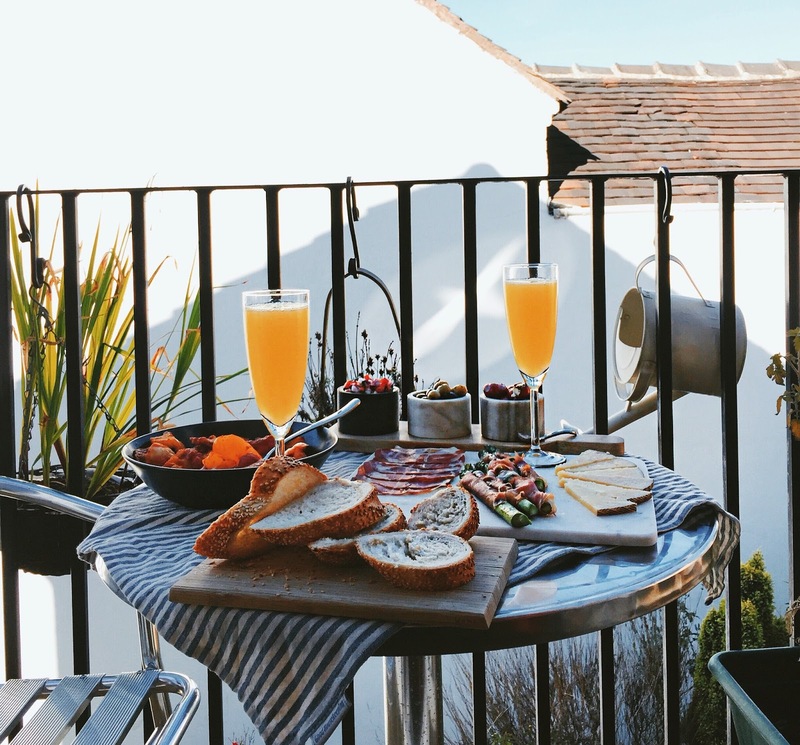 My last post was all about clinging onto my summer wardrobe with my Dancing Leopard 2 piece, but today we were actually able to sit out on the balcony (we didn't even have to wear wooly hats) and enjoyed some brunchy-tapas. Of course this picture looks innocent and orange juice fuelled, but there is absolutely prosecco in those glasses somewhere - obviously. My weekend has been relatively relaxed really - but whilst still managing to maintain a high food and drink intake for the entirety! I have some exciting things happening at the moment (bloggy things...all will be revealed soon!!! ), so I feel ready to hit the week head first with a can-do attitude. I can honestly say that I have never felt so determined and focused. I guess it also helps that in exactly one week today, I will be jetting off on a little holiday with my camera and laptop in tow. Estimated temperature to expect: 34 degrees celsius. That will do nicely. This was very much a spontaneous bit of food prep - but for those of you foodies like me, this brunch was made up of; olives, manchego cheese, cured meats, stuffed peppers, homemade salsa, potatas bravas, asparagus wrapped in parma ham, seeded bread, and of course - prosecco. May your Monday be great and productive! This balcony meal looks so peaceful.